Here is a wide range of brass and cast iron coat hooks cast from original hooks to provide a wide range of authentic hat and coat hooks from the Victorian to Edwardian eras. The brass hooks are polished and unlacquered to take on a patina over time, or can be bought ready aged for a more authentic look. The cast iron hooks are either waxed or lacquered and the wrought iron hooks are either as they come from the forge or finished with a protective wax coating. 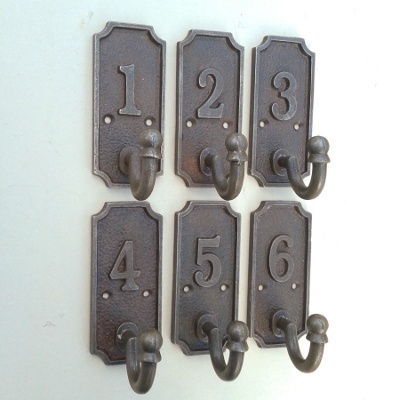 Each hook can be ordered individually or mounted on a hook board. 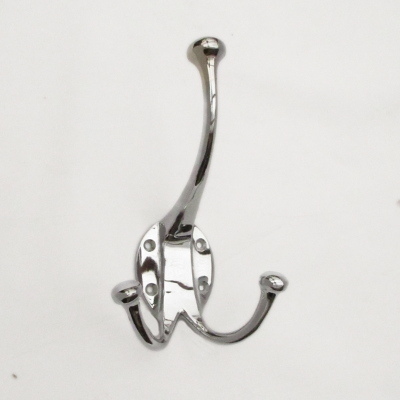 See our coat hook rack section. 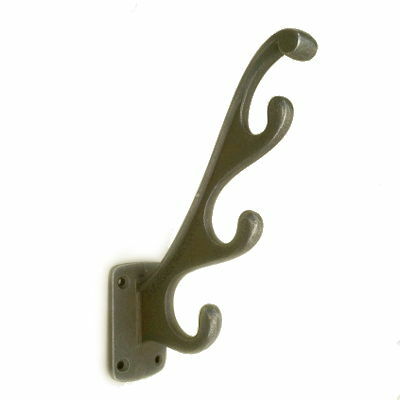 A popular and robust cast iron hat and coat hook. Size: 120mm (4 3/4") high x 130mm (5 1/8") projection. A large solid brass coat hook with a whip design. An elegant art nouveau style hat and coat hook in the shape of a whip. 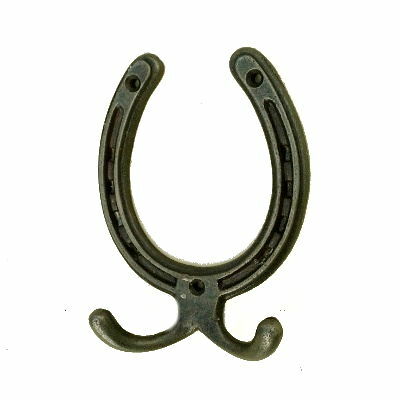 A perfect hook for the home or the tack room! Size: 185mm (7 1/4") high x 140mm (5 1/2") projection. The classic Victorian beehive hat and coat hook with circle detail to the round finial. Sizes: 153mm (6") high x 100mm (4") projection. The very popular cast iron double hat and coat hook will be back in stock in August. Size: 150mm (6") high x 100mm (4") projection. This small brass beehive coat hook is perfect for coats, clothes, or towels and tea towels. This is a small brass Regency style beehive coat hook, perfect for coats, clothes, or towels and tea towels. 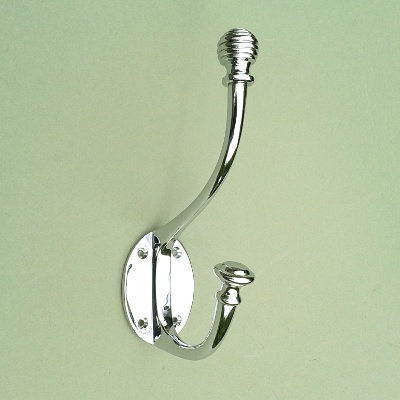 These are chrome Regency style beehive coat hook, perfect for coats, clothes, or towels and tea towels. The largest of our brass beehive coat hooks. 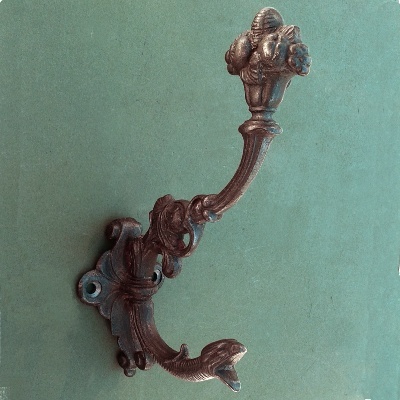 A typical Regency style hook ideal for use in the bedroom, bathroom or hall. Size: 75mm (3") high x 105mm (4.1") projection. The largest of our brass beehive coat hooks with an aged finish. 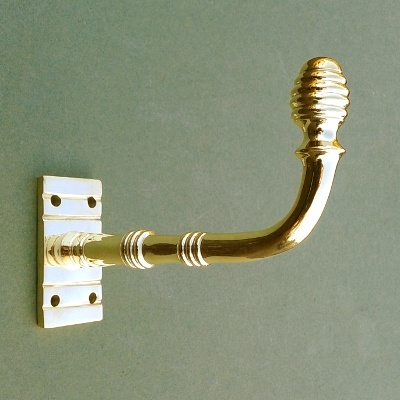 A typical Regency style hook ideal for use in the bedroom, bathroom or hall. Size: 75mm (3") high x 105mm (4.1") projection. A brass Regency style beehive double hat and coat hook with a round base and aged brass finish. Size: 137mm (5.3") high x 95mm (3.6") projection. 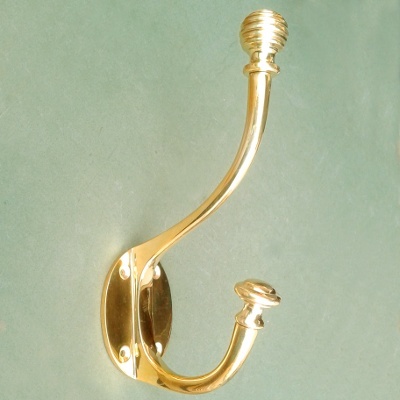 An aged brass coat hook in the Regency style with a long projection for its size. Size: 75mm (3") high x 105mm (4.1") projection. 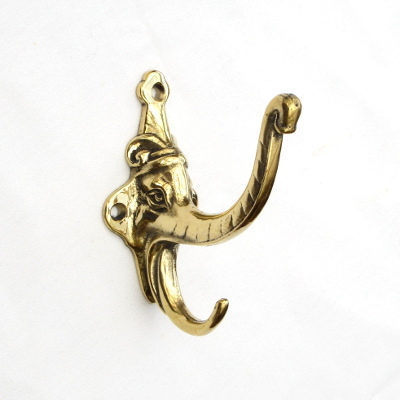 A small aged brass Regency style coat hook ideal for the back of the bedroom or cloakroom door. Size: 45mm (1 3/4") high x 56mm (2.2") projection. 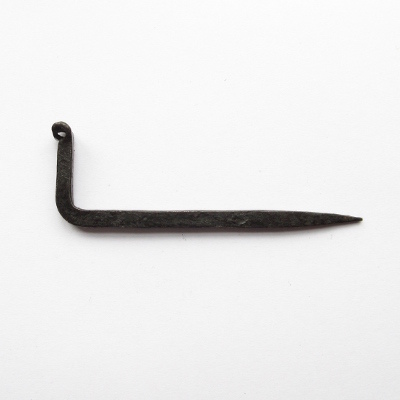 Originally a top hat hook, this smaller simple arts and crafts hook is perfect for the cloak room, bedroom or kitchen. Size: 95mm (3 3/4") high x 50mm (2") projection. A chrome clothes hook suitable for the kitchen, bedroom or bathroom. Contemporary style on an old design. A solid brass robe hook for use all around the house. A polished brass Edwardian style hat and coat hook. Essential for keeping coats and clothes tidy. Size: 150mm (5.7") high x 110mm (4 1/4") projection. 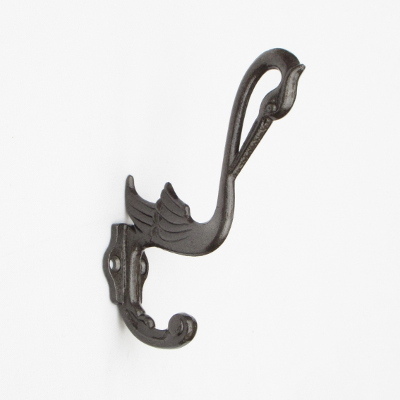 Cast iron pelican bird hat and coat hooks, ideal for a coat rack or on the back of a door. Sizes: 135mm (5 1/4") high x 95mm (3 3/4") projection. A dainty brass hat and coat hook with a ceramic tip to the end of each hook. An ideal hook for the back of a door. A dainty cast iron hat and coat hook with a ceramic tip to the end of each hook. A simple curved cast iron hat and coat hook with the shape of a shepherds crook. Size: 150mm (5") high x 110mm (4 1/4") projection. An ornate cast iron hat and coat hook with brass tips and a rectangular back plate. Size: 75mm (3") high x 135mm (5 1/4") projection. A large cast iron hat and coat hook with a stripe design which looks excellent on an oak board. Size: 160mm (6 1/4") high x 100mm (4") projection. The fine detail of these cast iron hat and coat hooks shows the image of a ram's head. A small Victorian cast iron hat and coat hook with fretwork detail typically seen on a coat stand. Size: 108mm (4 1/4") high x 65mm (2 1/2") projection. A beautifully elegant solid brass hat and coat hook. This popular cast iron hat and coat hook has a diamond shape design. The small cast iron acorn hat and coat hook is a timeless classic. Lacquer finish. The large cast iron acorn hat and coat hook is a timeless classic. The pretty colours of this ceramic tipped hook make this hat and coat hook a popular choice. Size: 155mm (6 1/8") high x 100mm (4") projection. This cast iron Art Nouveau hat and coat hook has an elegant style with soft curves. Size: 135mm (5 1/4") high x 100mm (4") projection. The horse shoe coat hook is a great design for horse lovers in the house or in the tack room. Size: 115mm (4 1/2") high x 84mm (3 1/4") wide. A perfect hook to put on a coat rack to tidy up the hallway or cloak room. Hang multiple garments on these robust cast iron hooks. Size: 185mm (7 1/4") high x 120mm (4 3/4") projecction. 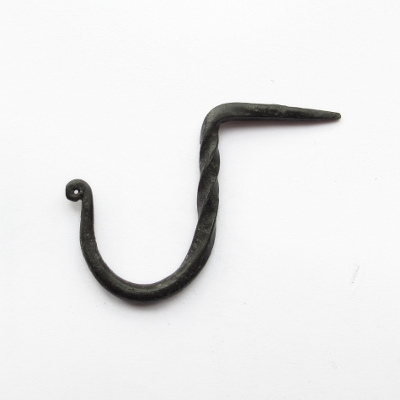 A small simple cast iron coat hook with an elephant trunk shape. Size: 65mm (2 1/2") high x 70mm (2 3/4") projection. A pretty petite hook for coats and clothes. Elegant brass beehive hat and coat hooks. An elegant brass victorian hat and coat hook.